(IndyCar)—A year ago, James Hinchcliffe came within minutes of bleeding to death in the wreckage of his car after a practice crash at the Indianapolis Motor Speedway. Next Sunday he will lead the field to the green flag in the 100th running of the Greatest Spectacle in Racing. Hinchcliffe was the last driver to make a qualification run and averaged 230.760 miles per hour in his four lap, ten-mile run, edging Josef Newgarden for the pole position by .0407 second. They’re joined on the front row by Ryan Hunter-Reay, the 2014 winner of the race. Qualifying for the 500 is done through two days of running with the nine fastest cars from the first day shooting it out on the last day for the pole and their final starting positions. The other 24 cars post times on Saturday and then re-qualify on Sunday on the basis of their Saturday speeds, with chances to improve their places in the lineup. Eleven drivers topped 230 mph in their four-lap runs on Saturday. But only five were able to top that figure in the Fast Nine Shootout: Hinchcliffe, Newgarden, Hunter-Reay, Townsend Bell, and Carlos Munoz. 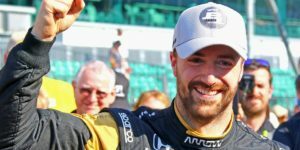 Hinchcliffe was badly injured last year when a piece of the front suspension pierced the structural tub of his car and went into his left thigh, cutting an artery and pinning him in the wreckage. Members of the Speedway safety crew quickly recognized the severity of his injury, cut him out of the wreckage, and got him to a hospital a few blocks from the track. “I came into this month hoping we’d have a new story to talk about after what happened last year and I think we did it,” he said after his run. Three-time winner Helio Castroneves had the slowest run of the Fast Nine, 229.115, and will start ninth. He was fourth on the speed charts Saturday. Other former winners will have work to do on race day next Sunday. Scott Dixon (2008), starts 13th in the 33-car field. Last year’s winner, Juan Pablo Montoya, starts 17th, one spot ahead of 2014 winner Tony Kanaan. And 1996 winner Buddy Lazier starts 32nd. Hinchliffe’s car is owned by Sam Schmidt, a former racer who became a paraplegic after a crash while testing an IndyCar in 2000. Schmidt, in an Arrow Electronics Semi-Autonomous Motorcar Project modified 2014 Corvette Stingray, ran four laps at more than 105 miles an hour and reached a top speed of more than 150 on the straightaways. 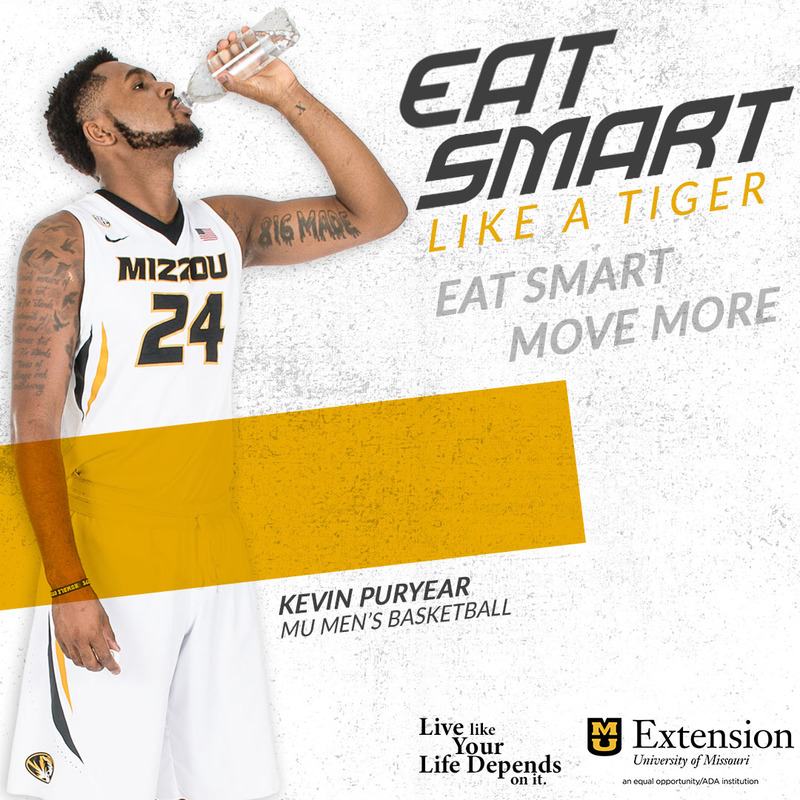 He did it by using his breathing and his neck movements. The car is outfitted so he can accelerate by blowing into a tube and braking it by sucking through the same tube. He wears 3D camera glasses that enable him to turn the car as he turns his head. Arrow Technologies, which sponsors Hinchcliffe’s car, is developing devices that help people with disabilities. (NASCAR)—NASCAR drivers prepare this week for their longest race of the year, the annual 600-miler at Charlotte Sunday evening. They’ll qualify on Thursday. Carl Edwards won the race last year. Missouri’s drivers had mixed results in the all-star contest. 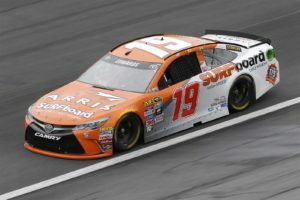 Edwards finished fourth in this year’s all-star race at the track this weekend after winning one of the preliminary races. 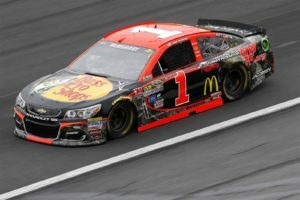 Jamie McMurray of Joplin came in 17th, driving a specially-decorated car sponsored by Springfield-based Bass Pro Shops and publicizing the National Wild Turkey Federation. McMurray’s best finish in the 600 mile race is second, in 2010. He won the October 500 mile races at the track in 2010 and last year. (Formula 1)—Ferrari driver Sebastian Vettel thinks Ferrari has a good chance to end a fourteen year winless streak at Monaco next weekend. Mercvedes drivers Nico Rosberg and Lewis Hamilton hope to reclaim their top-dog status after they took each other out of the Spanish Grand Prix earlier this month. Rosberg has won the last three Grands Prix of Monaco. The street course through the city has been a fixture on the F1 circuit since 1955. Some observers say it occupies the same coveted place in Grand Prix racing in Europe as the Indianapolis 500 occupies in the public racing mind in the United States.